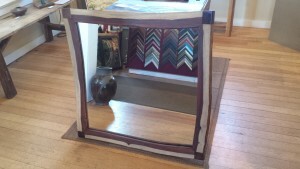 This is a custom frame we made with some exotic rosewood. as you can see the wood was too beautiful to square and miter like a traditional frame so we made a metal frame to the contour of the wood, we then used steel blocks in the corners,the steel was ground to the contour of the wood and then flame colored. as you can see I think the steel corners pulled the irregular wood together.